The Arizona Wildcats take on the Arizona State Sun Devils on Saturday at Sun Devil Stadium. The opening line for this game has Arizona as 2.5 point favorites and the over/under was set at 56. Anu Solomon finished his last game with 277 yards through the air for Arizona. He completed 17 passes out of 27 attempts for a 63% completion percentage. Anu Solomon led the Wildcats in rushing with 86 yards. He averaged 9 yards per carry on his 10 rushing attempts for the game. Cayleb Jones led the team in receiving with 5 receptions for 126 yards. He had an average of 25 yards per reception in the contest. As a team in that game Arizona got a total of 24 first downs by way of 9 rushing, 11 passing, and 4 by penalty. They ran 66 total plays for 460 yards for the game. The Wildcats ran for 158 yards on 34 attempts. 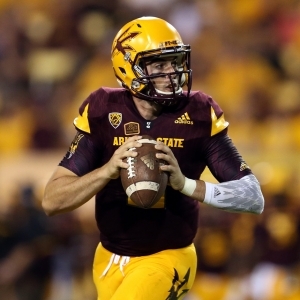 Mike Bercovici finished his last game with 253 yards through the air for Arizona State. He completed 22 passes out of 34 attempts for a 65% completion percentage. Kalen Ballage led the Sun Devils in rushing with 92 yards. He averaged 8 yards per carry on his 11 rushing attempts for the game. Devin Lucien led the team in receiving with 4 receptions for 63 yards. He had an average of 16 yards per reception in the contest. Arizona State got a total of 19 first downs by way of 6 rushing, 12 passing, and 1 by penalty. They ran 77 total plays for 397 yards for the game. The Sun Devils ran for 144 yards on 43 attempts. Arizona is averaging 36.7 points per game on the offensive side of the ball. They are completing 21.8 passes per game on 36.2 attempts for a 60.3 percent completion percentage and average 260.6 yards in the passing department per game. The Wildcats carry the ball for an average of 237.6 yards per game on 41.7 attempts for an average of 5.7 yards per carry this season. They also run 77.9 plays per contest and average 6.4 yards per play for an average of 498.3 yards per game. The Wildcats are averaging 25.5 first downs per game and they accumulate 49.5 penalty yards per game via 5.7 penalties. Arizona gives up 34.2 points per contest and an average of 271.1 passing yards each game on the defensive side of the ball. They allow an average of 22.3 completed passes on 35.4 attempts for a completion percentage of 63. The Wildcats give up 183 rushing yards per contest on 42.1 carries for a 4.3 average per carry. Arizona gives up 454.1 total yards per game including 5.9 yards per play. They force 1 turnovers per contest and get flagged for 7.5 penalties per game that total 70.5 yards as a unit. Arizona State is putting 31 points on the board per game on the offensive side of the ball. They complete 24.2 passes per game on 40.6 attempts for a 59.6 percent completion percentage and average 275.3 yards in the passing department for each outing. The Sun Devils carry the ball for an average of 178.2 yards per game on 40.5 attempts for an average of 4.4 yards per carry. They also run 81.1 plays per game and average 5.6 yards per play for a total of 453.5 yards per game. The Sun Devils get an average of 23 first downs per game and they average 37.8 penalty yards per game via 4.2 penalties. Arizona State surrenders 30.7 points per game and 297.8 passing yards each outing on the defensive side of the ball. They allow 21.6 completed passes per game on 37.1 attempts for a completion percentage of 58.2. The Sun Devils give up 124.8 rushing yards per game on 36.2 carries for an average of 3.4 yards per carry. Arizona State gives up 422.6 total yards per game including an average of 5.8 per play. They create an average of 1.5 turnovers per game and 6 penalties for 51.7 yards each game.